The auratus cichlid, Melanochromis auratus, is a freshwater fish of the cichlid family. 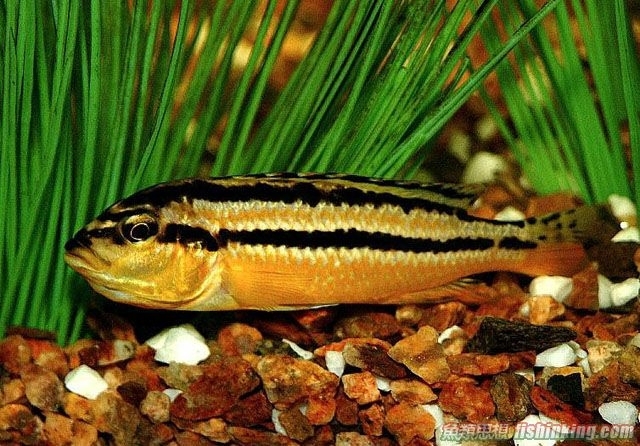 It is also known as golden mbuna and Malawi golden cichlid. It is endemic to the southern region of Lake Malawi, particularly from Jalo Reef southward along the entire western coast down to Crocodile Rocks. This cichlid is found in rocky habitats and prefers a pH range of 7.0–8.5 and a temperature range of 22–26°C. Auratus cichlids are small, elongate fish that can grow up to 11 cm. Juveniles and females are bright yellow with black and white stripes on the upper half of the body. Adult male coloration is drastically different with dark brown or black body and light blue or yellow stripes on the upper half of the body. 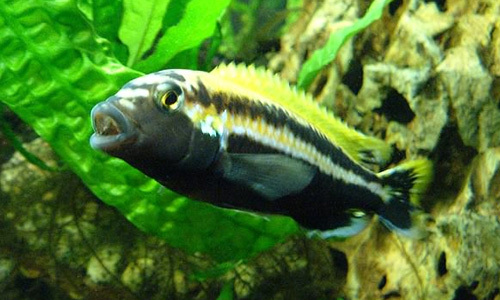 Like many other cichlids from Lake Malawi, auratus cichlids are mouthbrooders. Females hold their fertilized eggs and fry in their mouth for a few weeks before releasing the fry. 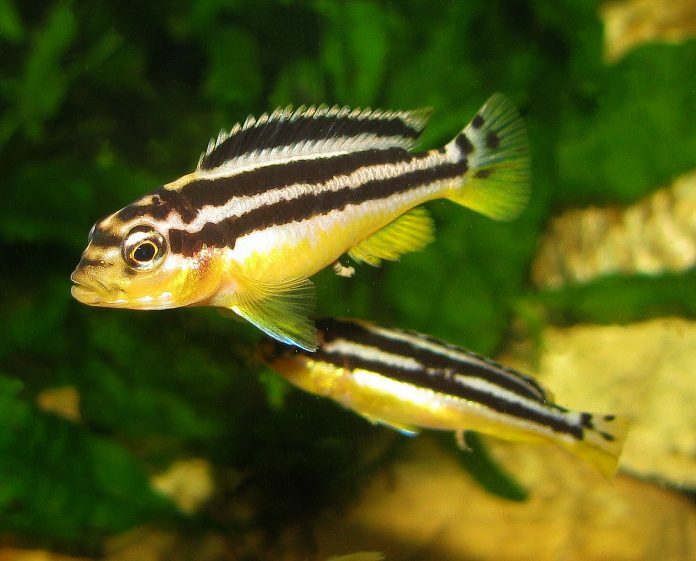 The auratus cichlid is one of the most popular mbuna cichlids in the aquarium trade. Juveniles of this fish have a striking coloration and are commonly available in most pet shops. 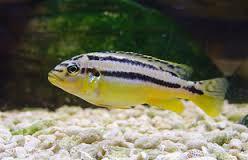 However, auratus cichlids, especially the males, are territorial and highly aggressive, even on the mbuna cichlid standard. In most cases, it is best to keep one adult male with many females. In aquarium stores, there will usually be one dominant male that is colored black, the rest will display the submissive “female” coloration of yellow. If this male is sold, the next dominant male will take on the black color. Their tank should be set up with a lot of rocks with caves and hiding places. Auratus cichlids natural food source is algae but those in aquariums will usually take whatever food that is fed to them.